In this project, we want to build a search engine for blogs, and try to use our method to rank the search results and compare to the googles’ results, final step is to let users to decide which ranking methods will be better. As you can see, in our result page we have two columns of results, the column A is the result retrieve from google by using google API. The column B is our ranking results by our page scoring method. 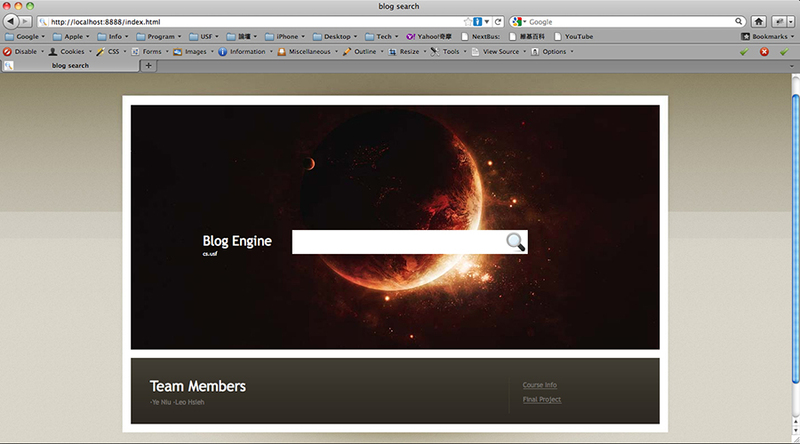 All page we have searched are all blogs by extract keyword wordpress. I would like to thank my team member Ye Niu he is currently working in the Youtube for this project, he helped a lot in project idea, server building and scoring page. Thank you and I can not finish this without you.